The gastric lymphomas include several histological subtypes of lymphoma, including diffuse large B-cell lymphoma (DLBCL), marginal zone B-cell lymphoma of mucosa associated lymphoid tissue (MALT lymphoma), follicular lymphoma, mantle cell lymphoma, adult T-cell lymphoma/leukemia, and so on. Of these, DLBCL and MALT lymphoma account for approximately 90% of gastric lymphomas. 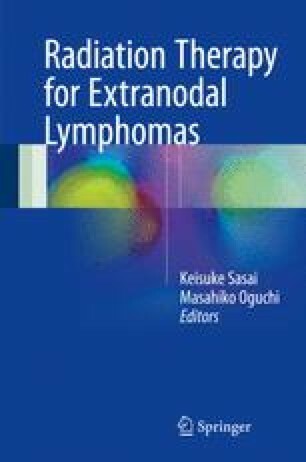 For localized DLBCL, the 30 Gy of conventionally fractionated radiation therapy (RT) following the short course of anthracycline-based chemotherapy combined with rituximab, such as R-CHOP regimen (rituximab, cyclophosphamide, doxorubicin, vincristine, and prednisolone) is a treatment of choice. On the contrary, the antibiotics for Helicobacter pylori (H. pylori) are first line treatment for H. pylori-positive MALT lymphoma. The H. pylori-negative cases and those who fail H. pylori eradication therapy are candidates for RT. Irrespective of histological subtypes, clinical target volume is defined as whole gastric wall. During simulation and delivery of RT, the management of inter- and intrafractional gastric motion is indispensable for gastric lymphomas. RT with doses up to 30 Gy could produce excellent local control and long-term outcomes without significant late effects in MALT lymphoma.